A classy collection of splendid-sounding orchestral phrases that your listeners will easily mistake for the real thing. Lush and inspiring cues; engaging interface; onboard mixing between sections; onboard convolution reverb; cool score sheet display. Not many playable patches; fairly resource-hungry. Of all musical genres, fully orchestral, Hollywood-style film music is perhaps one of the most difficult to pull off convincingly. Things have been looking up lately for bedroom-bound Barrys and Zimmers, though, largely thanks to companies like Sonokinetic, that seem hell-bent on providing ammunition for amateur scorists to raise the standard of their productions to that of major commercial movies. "The expert arrangements on offer here would not sound out of place on the soundtrack of a James Cameron movie"
Last year, Sonokinetic released Tutti, a ROMpler offering recordings of a full symphony orchestra playing together (as opposed to the sort of individual sampled instruments that you'd use to program your own arrangements in a note-by-note manner). Vivace follows Tutti's lead with a 9GB orchestral performance sample library containing over 16,000 samples, this time focusing on the uplifting, sweeping side of orchestral music, in contrast to Tutti's darker, often dissonant and atonal fare. It hasn't been out long, but Vivace has already reached v1.2. Chief among the improvements is a basic memory management system made up of tiny on/off buttons for each cue in the currently loaded instrument. Turning off samples frees up system resources - a big plus with potentially memory-hungry ROMplers. Adaptive Tempo-Syncing allows the sample playback within Vivace's TMP patches to adapt to tempo changes, to follow any accelerandos or ritardandos that you program within your host sequencer. and a new 'Tutti Sustains' patch round off the embellishments. 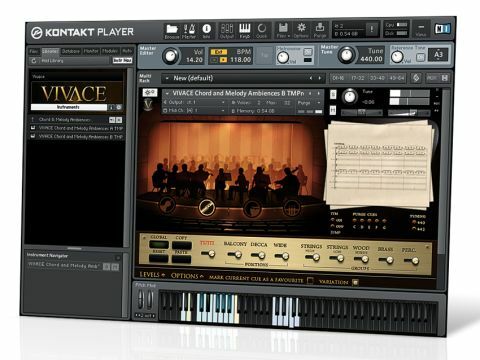 The download of Vivace includes a link to the free Kontakt 5 Player needed to run it, either in standalone mode or as an AU, VST or RTAS plug-in. As alluded to above, Vivace focuses more on the tonal aspects of the symphonic orchestra than Tutti, with a large selection of chords, themes and harmonic structures. Most of these musical snippets are tempo-synced via an intelligent tempo mapping (ITM) system, meaning that they'll follow tempo changes in your DAW. Each sample is recorded using eight blendable mic positions in all 12 musical keys, accessed by keyswitching so that they can be integrated into existing arrangements. When you first fire up Vivace, what makes it stand out is not just the quality of the recordings, which are beautifully captured slices of orchestral loveliness, but that of the composition and orchestration itself - the expert arrangements on offer here would not sound out of place on the soundtrack of a James Cameron movie. Most samples are four bars in length. Vivace doesn't offer that many tweakable parameters, but a four-band EQ and control over individual levels for mic positions and instrument groups help to extend the usefulness of each cue. One of the coolest features is the score sheet display that shows the full score for the current cue so that you can see exactly what the musicians played when recording it, adding an extra layer of fascination for those who want to learn more about scoring and orchestration. PDF versions of the scores for all cues can be purchased from Sonokinetic's website, which, as far as we can ascertain, is a unique service. So how does Vivace conduct itself in use? You'll need a fast computer with at least 4GB RAM for best results, and don't go expecting to be able to use Vivace as the basis for your own written-from-scratch arrangements, as there's a relatively small selection of fully playable patches. Vivace is all about providing pre-composed, ultra-realistic musical building blocks for you to use as you wish. If you're looking for a wide selection of orchestral effects, textures and phrases to add realism to your own arrangements, Vivace is well worth considering, and composers who need to deliver pro-quality soundtracks to a deadline should pay it particular attention.